“The Hurly-Burly Pot,” New York: 1850. With sectionalist ideologies increasingly endangering the Union in 1850, the artist attacks various interests of politicians across the nation, particularly abolitionist and Free Soil supporters. Using certain national figures to represent larger idea systems, the artist singles out for indictment radical abolitionist William Lloyd Garrison, Pennsylvania Free Soil advocate David Wilmot, New York journalist Horace Greeley, and Southern states’ rights spokesman Senator John C. Calhoun. The four wear fool’s caps and gather, like the witches in Shakespeare’s “Macbeth,” round a large cauldron. 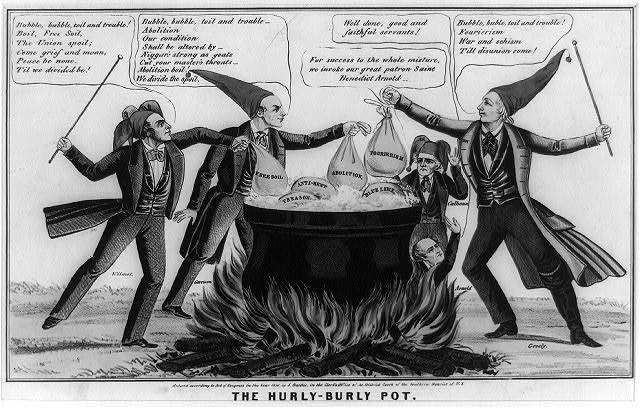 The men add sacks marked “Free Soil,” “Abolition,” and “Fourierism” to an already boiling and overflowing pot.